Formula 1′s decision to award double points at the last race of the season could be scrapped after next year’s Abu Dhabi Grand Prix, if not before, according to Ferrari president Luca di Montezemolo. The Italian told reporters attending a Christmas lunch at the Fiorano test track that he was no fan of the controversial rule change that has got fans up in arms and been branded ‘absurd’ by Red Bull’s World Champion Sebastian Vettel. “I am not enthusiastic about it, because for me it looks too artificial. We will see,” he declared. 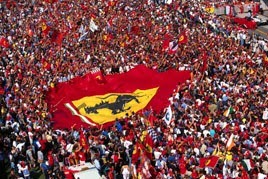 Montezemolo said Ferrari had not vetoed the measure when it came to a vote because they felt it was not an important enough issue to warrant such action. However, it would be discussed further. “I think the best way to find out may be to do one year as a test,” he said. “I personally have some doubts. I told this to [FIA president Jean] Todt and I told this to [commercial supremo] Bernie [Ecclestone] privately. Team principal Stefano Domenicali, who also attended the lunch, indicated that the double points decision was far from definite. Montezemolo cited the example of qualifying, which had an unpopular and short-lived phase of each driver performing a solo lap against the clock, as an example of the sport getting it wrong and having to backtrack. The governing International Automobile Federation (FIA) announced this month that double points would be awarded at the final round of the season from next year in an attempt to keep the title battle undecided to the end. Red Bull and Vettel have won the last four Drivers and Constructors’ Championships, with the dominant 26-year-old German this year taking a record nine wins in a row in a single season. The FIA said that the double points decision was unanimously approved at a meeting of its Formula 1 commission and the newly formed F1 Strategy Group, which includes Ferrari. The Italian glamour team,, the oldest and most successful in the sport, has a right to veto changes but Montezemolo was clear about when he felt it should be used.